Safe-T-Way's Type I, high quality terne plate safety cans offer a single spring closing cover for both filling and pouring. The one hand opening relieves internal vapor pressure before pouring. Type I cans are designed specifically for storage of flammable liquids, but ordered with the poly funnel, they become a useful can for pouring as well. We offer two great designs, with the standard SS model utilizing a zinc die cast handle and trigger mechanism and the less expensive SC model using a tubular steel handle. Both models have all the safety features you've come to expect from Safeway Products Inc. Both styles meet the requirements of ANSI, NFPA 30, OSHA 29CFR 1910.106, OSHA 29CFR 1926.125 and both cans are UL. ULC and FM listed. Safeway Prducts is the only manufacturer in the world that offers two styles of Type II cans. The standard in the field is the SP series. Long proven as the can all others are measured by. It comes with a zinc die cast spout and carry handle and is available in a variety of styles and colors. 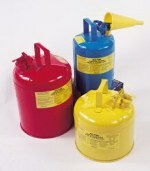 Safeway's Type II cans are designed specifically for safely pouring flammable liquids without spills. Made of high quality 22 gauge terne plate steel. Type II cans have two openings. One opening with a spring loaded cap is for filling. The second has a pour mechanism which provides totally enclosed vapor control through a flexible nozzle. The nozzle has a spark proof brass tip which allows accurate pouring. The pour nozzel also has an integrated vacuum relief vent that protects the can from implosion.model using a tubular steel handle. Both models have all the safety features you've come to expect from Safeway Products Inc. Both styles meet the requirements of ANSI, NFPA 30, OSHA 29CFR 1910.106, OSHA 29CFR 1926.125 and both cans are UL, ULC and FM listed.